(WORLD TRUTH.TV) Quenching your thirst could wipe out your memory, thanks to a flame retardant chemical. Patented as a flame retardant for plastics, and banned in food throughout Europe and Japan, a brominated chemical called BVO has been added to sodas for decades in North America. Now some scientists have a renewed interest in this little-known ingredient, found in 10 percent of sodas in the United States. Research on its toxicity dates back to the 1970s, and some experts now urge a reassessment. 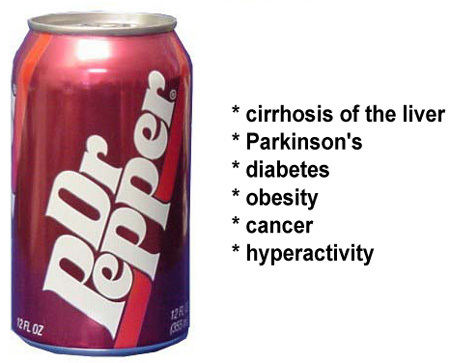 After a few extreme soda binges – not too far from what many video gamers regularly consume – a few patients have needed medical attention for skin lesions, memory loss and nerve disorders, all symptoms of overexposure to bromine. Other studies suggest that BVO could be building up in human tissues. In mouse studies, big doses caused reproductive and behavioral problems. Scientists originally created brominated vegetable oil, or BVO, for use as a flame retardant in plastics, but the food industry has been adding the compound to certain sodas, sports drinks, and juices for decades to keep the artificial flavoring from separating and floating to the top of the can, bottle, or glass. In the United States, 85 percent of kids drink a beverage containing sugar or artificial sweetener at least once per week, according to a study published last month. Sodas are the largest source of calories for teenagers between the ages of 14 to 18, according to a National Cancer Institute Study. For adults, soda, energy and sports drinks are the fourth largest source of calories, a federal study found. Hold a bottle of Mountain Dew to a light. It’s cloudy. Brominated vegetable oil creates the cloudy look by keeping the fruity flavor mixed into the drink. Without an emulsifier such as BVO, the flavoring would float to the surface. 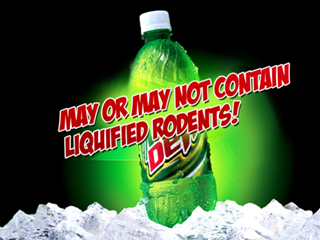 The FDA limits the use of BVO to 15 parts per million in fruit-flavored beverages. BVO was patented in the 1960s by chemical companies as a flame retardant. It is also used in light-sensitive photographic printing papers, as an additive for gasoline, to agricultural fumigants. It is composed mainly of bromine, a poisonous chemical whose vapors are considered both corrosive and toxic. Thyroid damage isn’t the only problem. Bromine is also a potential carcinogen and causes a number of disorders starting from simple headache, fatigue, weight-gain to cancer, heart and kidney diseases. Coca-Cola and Pepsi do not contain BVO but a whole host of popular fruit flavored sodas – the ones with a cloudy appearance – do. BVO stabilizes the fruit flavorings in the mix and helps create that cloudy appearance. If you drink Mountain Dew, Squirt, Fanta Orange, Sunkist Pineapple, Gatorade Thirst Quencher Orange, Powerade Strawberry Lemonade or Fresca Original Citrus, you’re drinking BVO. Soda makers and industry groups say BVO is safe and that their products meet all government standards. But there is now concern that the FDA limit for brominated oil in sodas is based on outdated data from the 1970s, and that it is time for this ubiquitous additive to be re-examined. Their concern is that it builds up in tissues, and may have the same effects as brominated flame retardants. A binge — for instance at a party or during a long night’s video gaming — has left some soda drinkers in need of medical attention for skin lesions, memory loss and nerve disorders, all symptoms of overexposure to bromine. Other studies suggest that BVO could be building up in human tissues, just like other brominated compounds such as flame retardants. In animal studies, big doses have caused reproductive and behavioral problems. In 1970, scientists in England found that rats on a six-week diet containing 0.8 percent brominated maize oil had stockpiles of bromine in their fat tissue. The bromine stayed there even after the rats returned to a control diet for two weeks. Another study around the same time confirmed that bromine was building up in humans. Researchers measured the serum levels of people in the United Kingdom – before BVO had been banned – and in their counterparts in the Netherlands and Germany, where BVO was not used. The studies found that UK residents had the significantly higher levels of BVO in their bodies and that the largest amounts were found in tissues of children. Based on data from the early studies like these, the FDA removed BVO from the Generally Recognized as Safe (GRAS) list 1970. But in 1977 after heavy lobbying from the soda industry, the FDA approved the interim use of BVO at 15 ppm in fruit-flavored beverages, pending the outcome of additional studies. More than 30 years later, BVOs approval status is still listed as interim. Critics say that soda makers in North America could easily replace BVO with alternatives such as naturally-derived hydrocolloids – chemicals that are used in many sodas in Europe. But manufacturers are resistant, insisting that reformulation is unnecessary and would be costly. Environmental Health News reports that changing that status would be expensive and quotes FDA spokesman Douglas Karas saying it “is not a public health priority for the agency at this time. “Since the alternatives are already used in Europe “their performance must be acceptable, if not comparable, to the U.S.-used brominated systems.” That means “the main driver for not replacing them may be cost” Wim Thielemans, a chemical engineer at the University of Nottingham in the United Kingdom said.